Unfortunately, people every day are victims of personal injury caused by others negligence. As experienced Chicago personal injury lawyers we have handled many types of personal injury cases. The area of personal injury encompasses a wide variety of cases, including but not limited to automobile accident, trucking accident, airline crashes, boating accident, slip & fall accidents, dog bites, construction accidents, work accidents, boating accidents and medical malpractice. For more information about these areas of personal injury, click onto that area in our “Practice Areas” section. 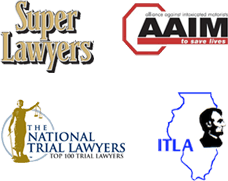 Our Illinois and Chicago Personal Injury attorneys are prepared to help you with the legal matters following an injury. Nemeroff Law Offices represent many victims who are injured or killed by the negligence of others. We will help you recover the money damages you or your family is entitled to.